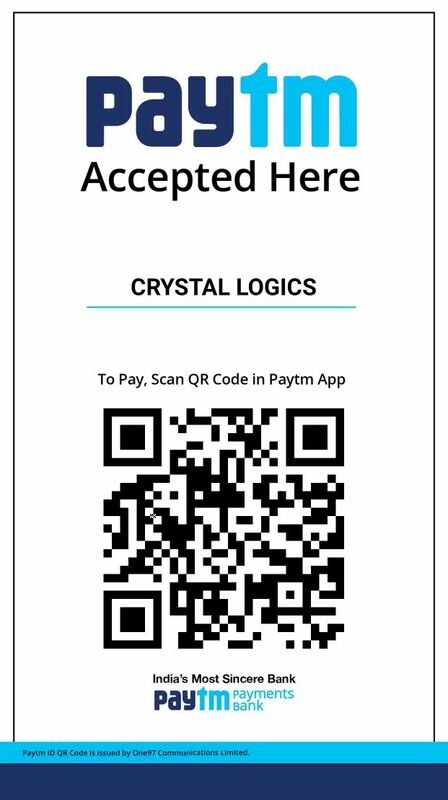 A PRODUCT OF CRYSTAL LOGICS PVT. LTD. Interested users may make the payment through any one of the payment modes given below. Please read thoroughly our Payment Terms & Conditions given below carefully before making payment for purchasing any of our Software or for availaing any of our services. 1. CRYSTAL ICR is a product of CRYSTAL LOGICS and legally protected by law. It may only be used with the prior written permission of CRYSTAL LOGICS in each specific instance. Use of the CRYSTAL ICR Software screenshots or videos for commercial purposes without the prior written permission of CRYSTAL LOGICS will constitute trademark infringement and unfair competition in violation of law. 2. All logos, splash screens and software headers displayed on this Software are service marks, trademarks of CRYSTAL LOGICS or its third party licensors. Except as expressly permitted herein, using, copying, transmitting, displaying, modifying or distributing any Marks in any form or by any means without the express written permission of CRYSTAL LOGICS is prohibited and may violate the copyright, trademark, privacy or other laws. 3. Copyright in this software (including without limitation, design, logos and software) is owned and licensed by CRYSTAL LOGICS. All materials contained on this software are protected by Indian copyright law and may not be copied, reproduced, distributed, transmitted, adapted, or dealt with in any form or by any means or in any media without the prior written permission of CRYSTAL LOGICS. You may not alter or remove any copyright or other notices from copies of the content. 4. CRYSTAL LOGICS hereby admonishes you to make sure that you completely understand all of the risks before accessing any of the Software (including without limitation, the potential infection of your system by computer viruses and loss of data). You are solely responsible for adequate protection and backup of the data and equipment used in connection with any of the Software. 5. CRYSTAL ICR Software is specifically designed to recognize and convert text from even extremely low resolution images also. However, there are some cases in which the software fails to recognize the text such as, if the text in the images is not perfectly straight aligned or the font size in the images has been changed etc. We strictly recommend the buyers of our software or customers who avail our data conversion services, to test our software / services thoroughly with a demo / trial, before making any payment to us. CRYSTAL LOGICS PVT. LTD. reserves the right to reject any claims regarding any kind of issues related to the purchase of our software / data conversions, and no refund of Software Cost / Data Conversion Service Charges or any other amount will be provided by any means, once the License Code / Data had been delivered to our customers.